This USD/TRY converter is not only a currency converter, it has 4 key features such as monitoring your exchange rate and it also allows you to calculate before converting. When you set your wish rate, this app will check every hour the exchange rate and once it will find out that the current exchange rate equals or is more than your wish rate, then you will receive a notification informing you that your wish rate is now possible ! 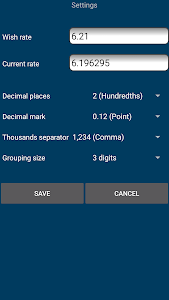 Moreover you can anytime enable and disable your wish rate if you don't like to receive too many notifications, and it will deactivate automatically itself when you receive your first notification and you can of course reactivate anytime if you still want to monitor the rate with your new wish rate which you can change its value with another value. 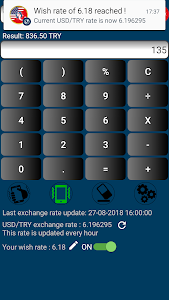 Regarding the conversion it's vice versa you can either convert US Dollar to Turkish Lira but also Turkish Lira to US Dollar, and it's possible for you to calculate before the conversion, after choosing from which currency you want to convert, then the calculator will copy paste the result to the currency you have selected. 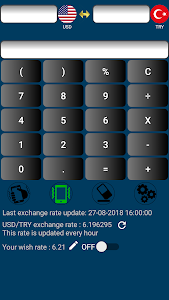 Convenient for traders from the Foreign Exchange Market (Forex) who want to monitor the rate of a currency pair such as USD/TRY. Similar to "US Dollar to Turkish Lira or TRY to USD"